Awesome! Did anyone snap any pics on their phone? THANKS for the report, Daniel! I hope to ride Chadwick before snow falls. This was the only picture we got, we aren't very photogenic guys. I got a short vid of Kyle going up a long hill just to prove to my wife we were actually there and riding, it was lot tougher than it looked, i'll add it to post after it loads. But this pic was at the top of a ridiculous long climb coming up from a crick bottom that we didn't think was going to end, needed a break for sure after some of the long ones that got nastier the higher you got up the hills and ledges just kept getting bigger.. We found a lot of really good fast tight flowing single track in the bottoms (mostly dirt) and with plenty of fallen trees or roots to kick off of, then you can split off anytime when u see a track and start heading up for a different mix of terrain.. I think it's at the top of my list right now out of everywhere i've gone. Last edited by DanielKeimTS on 17 Oct 2016 11:02, edited 2 times in total. I figured out how to get the all the loops and tracks we did into gpx files or whatever else kinda gps stuff..luckily got some good ones before the battery died i forgot to charge it. Can post the gpx files or links to it on dwmaps or garmin connect. Here are my favorite that wore me out big time and got us into the areas where we were able to go back and find trails that connect to these loops. Its awesome not seeing a single 4 wheeler. I didn't want to start a new thread, so I just grabbed this recent one. Looking for options on where to stay at Chadwick? Would like to rent a cabin, but if that's not an option, where is a good place to camp? 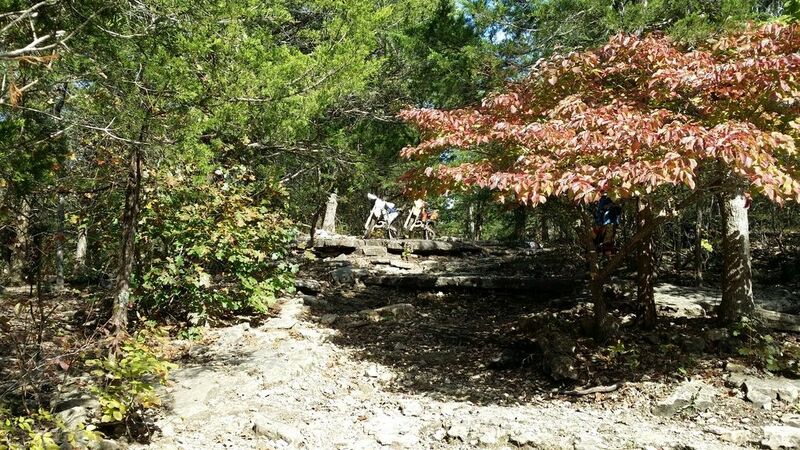 Can you ride from the cabins to the Chadwick trails? Thank you! The Outdoor Inspiration Cabins that Ed points out are the only cabins near Chadwick that I'm aware of. Joel has 2 nice, small cabins that sleep 4 each, although one is setup with bunk beds and a full...so 3 guys unless you are cozy. Bathroom, shower, coffee pot, microwave, mini fridge, BBQ grill with gas, dining table w/4 chairs, small TV. Bedding, towels, and basic eating utensils provided. The cabins are almost right across from the Cobb Ridge Campground, but it is technically illegal to operate a non street-legal vehicle from the cabins to the riding area because you have to traverse < 1,000 feet of highway and the paved road going into the park is also not legal for off-road vehicles. That said, we've never been bothered. Joel does remind folks that you should trailer your toys to the campground. I've never stayed in the campground in the park, but it looks really nice and maintained. Buy your Mark Twain OHV permits at various locations, but I like to support Kay's Country Store which is right up the highway from the park. There really are not any close restaurants. Kay's has some food items, but otherwise, it's 30 minutes to restaurants. So bring food. I think Chadwick is better than most people think (primarily Arkansas crowd). Lots of tough trails and tons of single track if you know where to look. Fairly close for us KC folks as well. Makes for a long day trip but it's possible.